Xoe, Chrissy and Charlotte: three women – complete with glitter, chains and leather – not to be messed with. They love Cuba Street, what they do and each other. 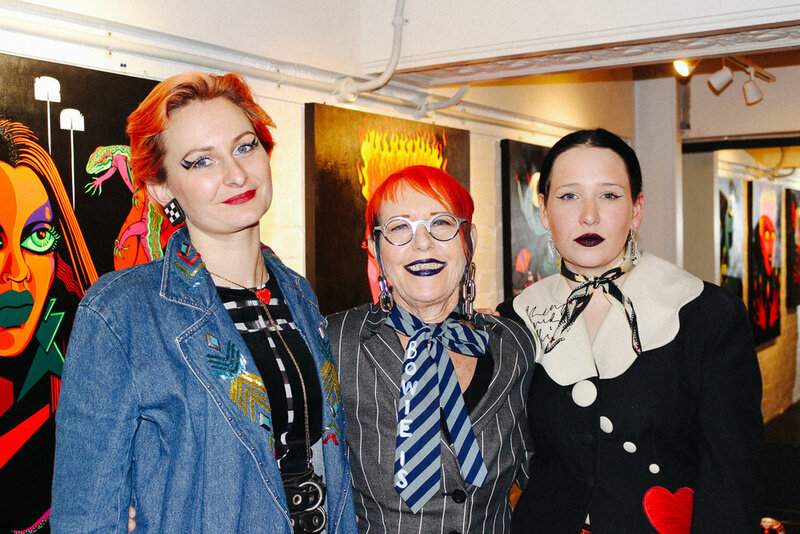 Now life-long friends, this trio staunchly believe in the power of fashion and art to Wellington and are breaking into the gallery scene together. These three Wellington women are behind the new Hunters & Collectors Gallery in Wellington. Known as one of the most popular spots in the city to seek and sell retro clothes, Hunters & Collectors has an eclectic and feminine energy, generated by its owner, manager and patrons. The space above the store, formerly used to sell second-hand furniture, has been recently converted into, ready to show off Wellington’s brightest artists. Local legend Xoe Hall is first to christen the space above this iconic shop on Cuba Street. ‘Duster Biter – A Colourful Essay on Darkness’ is the result. Hunters & Collectors grew to locations all around New Zealand, making their own leather label, and gradually changing the face of second hand fashion across the country. Xoë was born in Upper Hutt but grew up proudly in Porirua. Her father painted and together with her mother the family owned a farm and Boarding Kennels and Cattery. 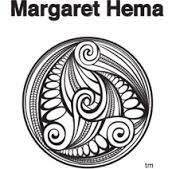 "We were located in Pauatahanui, back then a small farming village" she explains. “Because my parents worked so hard we were brought up by our babysitter Karen, who my mum handpicked as a goth to educate me and my feral sisters. She taught us everything about bogan style and 80’s horror films”. “My first job was as a pooper scooper working for my parents” Xoë remembers, laughing. The friendship deepened and over years consolidated. Then came the decision from Chrissy to open the gallery. “I was talking about doing a Gallery and I spoke with Charlotte about the idea and she was keen to do it!” says Chrissy. “I was sick of moving the furniture up and downstairs” says Charlotte. “It just seemed like the perfect idea and perfect timing.” Charlotte and her family painted the space. “It was a real family thing” says Chrissy. “We were also worried we wouldn’t have enough people keen. But suddenly, we started to talk to our friends about it. Now we’re booked up with shows until the end of the year.” “It’s not traditional” states Charlotte, “The way we will do it will be our own way” echoes Chrissy. "I don't want to take the credit for opening the gallery as that was totally all Hunters but obvious I am a massive supporter of the idea and have been exhibiting for years so it was perfect" explains Xoë. Wellington is the perfect place to have a store like Hunters & Collectors, explains Charlotte. “You couldn’t support it in other cities” she says. “Wellington people support it. The people don’t do generic. Wellingtonians wear a crazy coat to work or to the supermarket. They don’t care.” “I wouldn’t be doing what I’m doing if I wasn’t in Wellington” says Xoë. “And everyone is friends. It’s not competitive and we all respect one another is amazing. I am proud of my cool friends. We’re thriving.” says Chrissy.